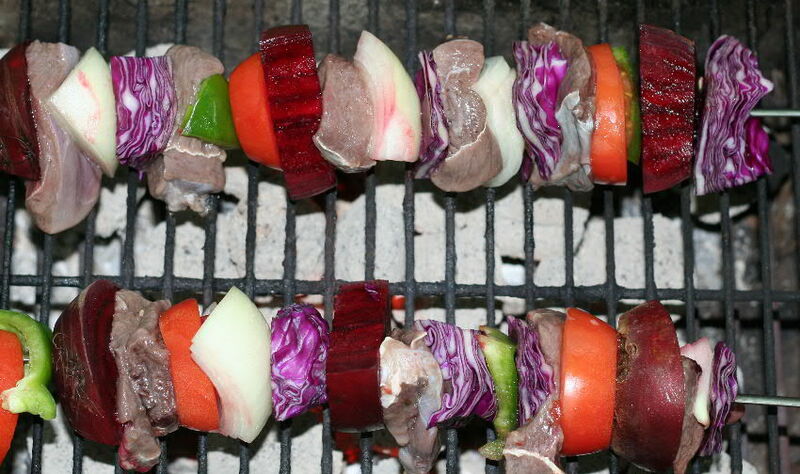 Beek kabobs and red cabbage: A May Day meal. A nearly all red kabob using deer meat, beets, red cabbage, red onions and Roma tomatoes. Fatigue does interesting things to my brain in that it often goes off on wild nonsensical tangents with little provocation. Good friend Bill Krantz sent me an E-mail where he said that he was going to do a beef-kabob on a grill for his and a friend’s supper. He struck a wrong letter and it came out “beek-kabob” instead. My mind took off and decided that it wanted to ponder what a “beek-kabob” might be, and it derived a May Day kabob of all red elements, including beets, red cabbage, red potatoes, red onions, Roma tomatoes, red bell peppers and the meat from a red deer. Although there are some red deer in a pen not 20 miles from me, I did not have any red deer meat; but I did have sufficient meat from whitetail deer to make a reasonable approximation. I thawed the deer and marinated it overnight in Italian dressing to give it some garlic and spice. Come cooking day, I washed and sliced up one beet root, cut the cabbage and other vegetables and then skewered the meat and vegetables prior to putting them on the charcoal. Not all plans go ideally. I forgot the red potatoes and red bell peppers costs four times the price of the green ones, so I compromised. On with the cooking. The beets were sort of tough, so I put them on top of some of the hotter coals. I turned the kabob four times to give each quarter some cooking time. The result was a little black on the edges of some onions, but the deer meat was done. This ate well and gave a crunchy sort of vegetable, rather than being cooked to mush, as we Southerners so often do. The beet sections were warm and soft enough to chew. Red cabbage with beets, beet greens, onions and bell peppers. There was still a lot of components left over. I washed and cut up the other three beets that were in the bunch, trimmed the leaves, chopped the cabbage and put the remaining bits of bell pepper, onions and tomatoes all in one pot and added sufficient water to cover. I also put in a quarter-cup of diced deer roast that I had from a previous meal. The beets, comparatively few beet tops, and cabbage colored the contents of the pot red including the liquid. 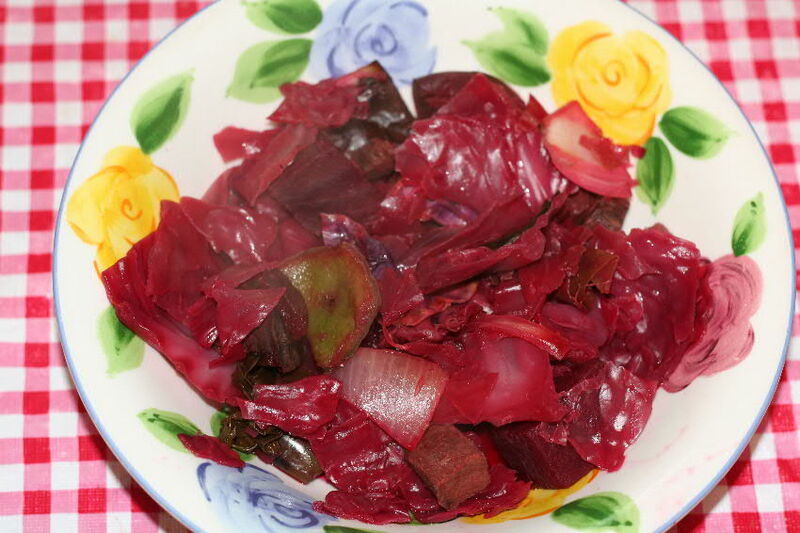 There was a slight sweetness derived from the beets that flavored the cabbage. The result was an interesting variation on boiled cabbage that turned out very well. The only seasonings that I added was a quarter-teaspoon of salt. Needless to say, these dishes were consumed with a glass of red wine to complete the all-red (or nearly so) May Day theme. I don’t know if anyone needs or wants a May Day meal, but here is one for you – Beek-kabobs and red cabbage. Enjoy. This dish has been tested and received the enthusiastic approval of hound dogs, Demeter, Ursus, Diana and Casey. Informative post in this blog. Most of what I read online is trash and copy paste but your posts are not alike. Bravo. I like to read and advise all my friend to read this blog. Thanks for sharing. I also enjoy Beef. Many Dieticians feel a side issue that eating Beef will age us. They claim one way to stop this is by adding Rosemary to Beef etc and let it “Soak in for 2 hours”. These usefull informative articles are frequently found on, The Spirit Daily.com.